The grill is on. Guests are gathering. Now, it’s time for the burgers! 1. Plain and simple. We’ve found that the key to a great burger, particularly one that isn’t hidden under a deluge of condiments, is to make the patties with as little “handling” as possible. Don’t jam that meat together on a cutting board or beat it into a dense little hockey puck. Instead, use as little force as you can to gently create the general shape, and then stop! Putting a small thumb-sized indentation in the top will help to keep it from “plumping” too much as well. Season with flake or kosher salt, ground pepper and a dash of garlic salt. 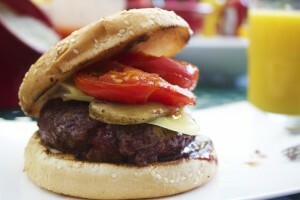 Finally, resist the temptation to mash down the burger once it’s on the grill. This does nothing except eject the juices and makes for a dry final product. 2. Cheeseburger. Cheeseburger. Cheeseburger. This ingredient is the beginning of what makes burgers really special. Nearly any cheese will work, but be aware of their melting points! There is a reason the classic around these parts (for the non-nouvelle chef) is American cheese. Since it is often a combination of Cheddar and Colby, it has a melting point that is ideal for the grill. But what else can spark your burger buds? Brie is soft and creamy. Goat cheese is smooth. Gouda is gooey and delicious! But our secret ingredient is French Boursin, a spreadable cheese you will learn to love! 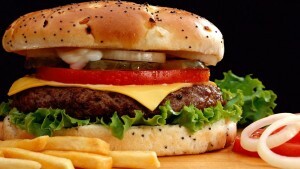 It has a great tang and really complements that great burger taste. Be forewarned, however; Boursin won’t melt much, so just plop a dollop on top of the burger about a minute or two before they’re done. 3. Sliders. Yes, the humble slider. Once a mainstay of early chain restaurants like White Castle, White Tower and Little Tavern Shoppes (“Buy ’em by the bag!”) there is still disagreement about the origin of the name, but no one will argue about how great they are. In recent years, they have popped up at fancy hipster restaurants everywhere in all sorts of varieties. In fact, just last week I had four “chicken pot pie sliders!” So how are they different than a regular burger? In their original incarnation they were often cooked on solid top grilles in a fast food place and were often square (less wasted space on the grill!) but what makes them awesome today, is that you and your guests can experiment with various toppings and still not feel stuffed. You simply can’t do that if you build yourself a giant half pound burger. 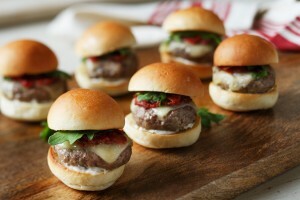 One tip; since they are small, they are going to cook quickly, so try to get all the sliders onto your grill at about the same time, so that they’ll all get done equally. Slide away in the summer of 2018, America! Anything goes! 4. Lettuce Entertain You! But seriously, folks, if you want some of the classic toppings, make sure they are the best quality possible. While iceberg has been the go-to lettuce seemingly forever, we’d suggest trying romaine. It retains a great crunch, even under the heat of the meat. If crunch isn’t your thing, then dare we say arugula? 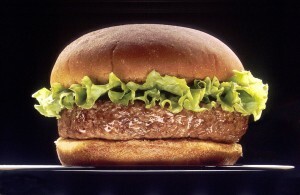 It’s something of a gastronomic joke at this point, but its strong flavor really holds up to a powerful burger! As to that slice of tomato? Go the extra mile and get yourself two heirloom tomatoes, one yellow and one red. Slice them thin and pile both on. They’ll taste AND look better! 5. Hamburger Bun Options. As I mentioned, a tasty brioche works great for burger buns. This French delight is a kind of a bread with added butter, eggs and a touch of sugar. So while it’s savory, it also has a bit of French pastry about it. But don’t get me wrong, this not a sugar laden honey bun! There are plenty of other bun-options, of course. For instance, some people go for onion rolls, with bits of tasty onion embedded in the crust. That way you get a great taste and don’t need to chop or add your own onions. A classic sesame seed bun is also tasty and for much the same reason; you get two tastes for the price of one! Slightly more exotic, but no less delicious is the English muffin. With their unique taste and texture, they really add a fun style to your bun. Just make sure you toast them gently before using. Finally (and this is not an exhaustive list by anyone’s measure!) how about just using two pieces of bread? In the New England area this approach was made famous by the Friendly’s restaurant chain. And while it can sound boring, it isn’t! Also, for the mom or dad that forgot to buy the buns — it can be a real lifesaver! Finally, burgers are meant to be eaten outside this time of year, so browse the Fifthroom range of dining sets, umbrellas and other outdoor living must-haves, then light up the grill and get cookin’!